If I could figure out a way to incorporate this passion into my job, I would. Because I honestly enjoy it that much! When Scott and I were engaged we bought a house that did not fit our taste. We spent our first year of marriage and a ridiculous amount of money having our house turned into what looked like a model home. Every room was like a showroom with beautiful furniture perfectly placed. At the time we were considering this house a short-term investment, and had planned to move again before starting a family. Well, eleven years, three kids, and four dogs later, we are still in the same house! All the money that we spent on new floors and expensive custom paint jobs are now oozing with character, and many elements now have their own “distressed” look. But what I hope people feel and notice when they walk through my front door is not the imperfections, but that this is a house filled with love, laughter, and is completely set-up for our children and their happy childhood. Over the last few years I have enjoyed the challenge of making our home fully functioning for my amazing little sweet peas. I’ve realized that if I set up impractical spaces, things will not stay as I had designed. My poor husband comes home quite often, after a long and stressful day, to find me moving furniture, switching rooms, rearranging all the toys, and eagerly asking for his help as I run past with another load of things to take upstairs. Each room in our house has gone through transformations, and has changed uses many times over. And, as our kids continue to grow, their needs and lifestyle will continue to change. So I’m afraid that my dear husband will be putting up with this chaos for a very long time. But recently I made a few changes that I am quite proud of, and decided to share them incase it would give any of you other moms some new ideas. First, let me explain our set up. From our garage you enter a laundry room. Half of it is the washer and dryer with a closet, and the other half has been taken over by doggie beds and food bowls. From there you walk through a hallway into our kitchen which has a very large center island. 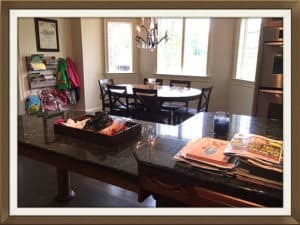 And while I’m thankful for the size of my kitchen, this island has become the dumping ground for anything and everything every time we walk through the door. Over the years I have tried to set up other areas in the house to unload our stuff, but it was never convenient enough. So, if the kitchen is where everything ends up, then I was determined to make it work. Below are a few pictures of what I have added. I know this no longer looks like the model kitchen it once was, but this has gotten our “mess” a bit more organized. On the island I have a “catch-all” tray. All the little things get thrown on here. Every couple of days (or weeks) I go through it and try to put everything in its place. And if I’m expecting company, it only takes a few seconds to pick up the tray and relocate it to another room. The pile of stuff on the level behind the tray is my mail pile. Some things it takes me awhile to go through, or there are papers that I have yet to do something with. But the cabinet below has one empty shelf that I can place that pile in whenever needed (again, if someone stops over). 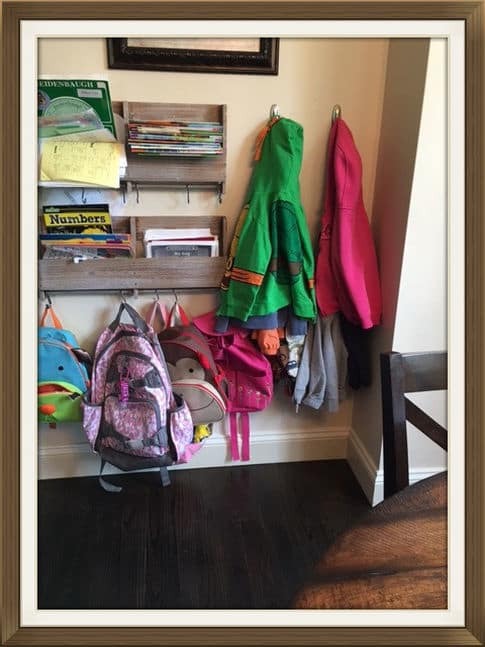 While the wall of slots and hooks is not the most beautiful accessory, or ideally placed next to our kitchen table, it’s where everything happens. All of those slots are for the kids and their school papers – which we end up working on at that very table. The hooks are for their school bags, totes, and jackets. 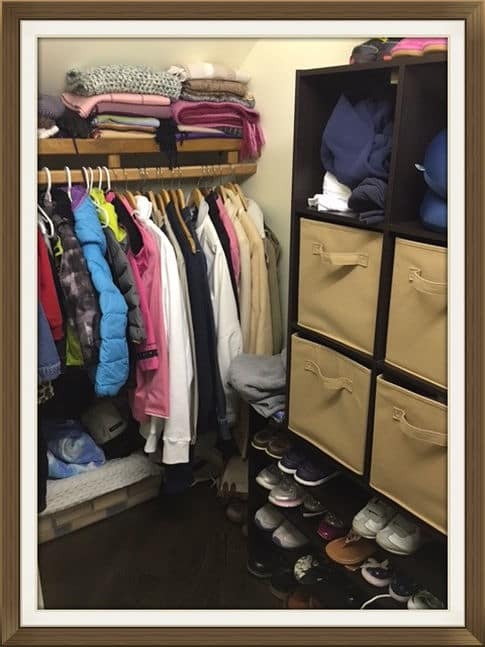 I have tried hanging coats and bags in several other places around the house. But guess where I ALWAYS found them – thrown on the kitchen island. So that is why I chose such a non-ideal place for this storage, because it works the best here! Lastly, the closet under the stairs. This has been a space that again has served many purposes over the years. It has been an art space for Mady, an indoor playhouse, a tent, hide-out, storage, and I’m sure even more. 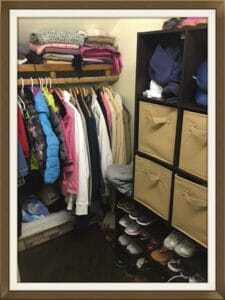 Recently I bought a few shelves, a set of cubbies, and had my husband hang a clothing rod. Now, it is where we keep the kids out-of-season coats, mine and Scott’s coats (because we don’t mind hanging our things up), all our snow gear, and all our frequently used shoes. Because, lets face it, kids are really bad at caring their shoes up to their bedroom closet every time they walk inside! While I know that my house has a different layout than yours, my goal was for you to read this and stop feeling like you need to continue any unrealistic ideas or plans for your home. Everyone that stops over knows that we have kids. So I hope seeing their evidence is not shocking. We now decorate and use this house fully in a way that works for us in this current phase of life that we are in, and I would encourage each of you to do the same!